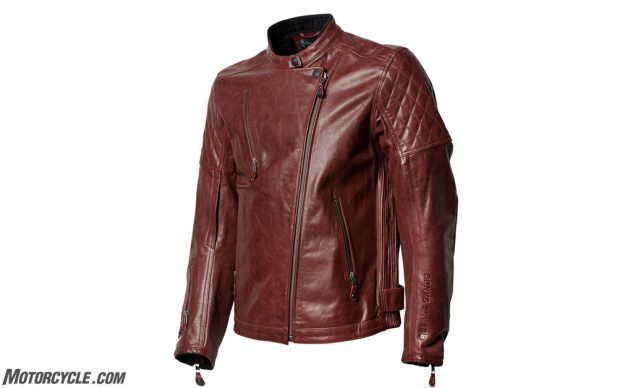 If there’s a piece of apparel most associated with motorcycling, it’s undoubtedly the leather motorcycle jacket. As riders, we associate leather jackets as part of our uniform, but even non-riders search the bins for cowhide say, when they want to dress up for Halloween. No matter what you ride, the leather jacket is versatile enough to look at home nearly anywhere, and on nearly anything. 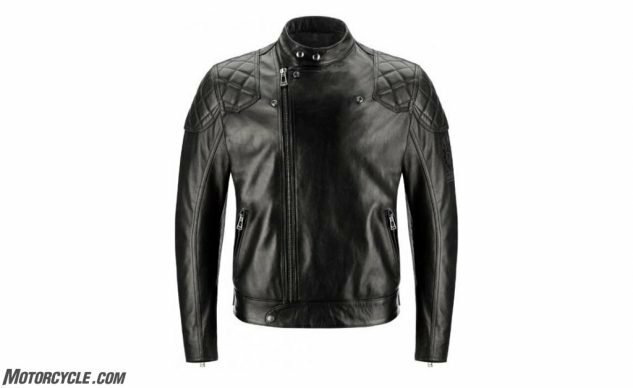 The beauty of leather motorcycle jackets is they will likely never go out of style, and the more you wear them, the more comfortable they will feel – there’s just something about leather that other materials can’t match. 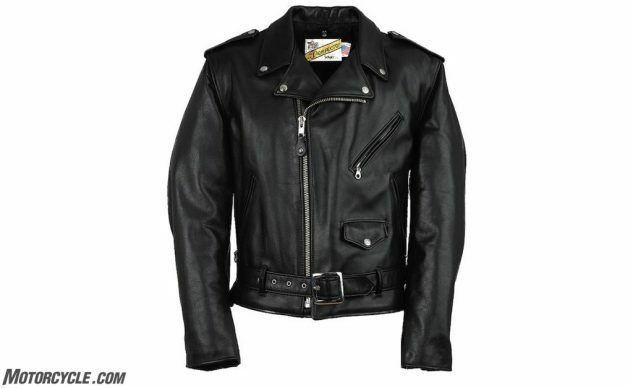 Leather motorcycle jackets are bountiful and ubiquitous, with seemingly endless options to choose from. It would be impossible for us to feature every single jacket out there, so here, we’ve gathered a small sampling of what the market has to offer, listed in alphabetical order. 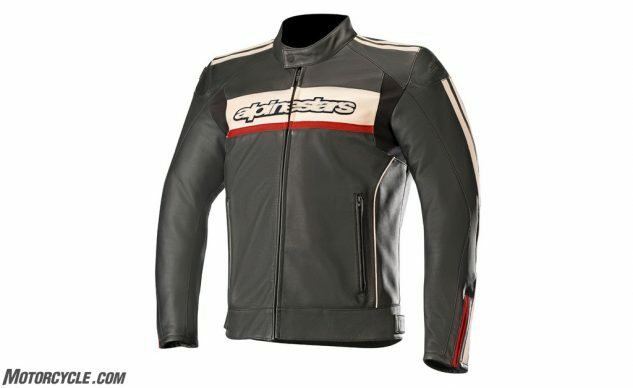 The original Dyno jacket from Alpinestars was one of the first leather jackets the company ever made. It became a best seller, too, so after a long wait Alpinestars has finally released an updated, version 2.0 of the Dyno. A fully CE-approved jacket, the new Dyno is made from supple leather with stretch panels across the chest for greater mobility. Two exterior pockets are paired with a waterproof internal pocket, and snaps at the waist help make for a better fit. CE certified Bio-Armor sits in the shoulder and elbow pockets for impact protection. A modern take on a vintage-ish jacket, the Dyno is classically understated but still has plenty of pop. From the absurdly expensive department comes the Ivy 2.0 from Belstaff. At $1650, it’s the most expensive jacket on this list by a country mile. But what does a giant wad of cash get you? In short, extravagance. Bull leather construction from 1.0-1.1mm thick hide, the Ivy 2.0 also gets cotton/viscose lining. The diamond pattern on the shoulders and elbows (along with CE approved armor underneath) is a signature Belstaff feature, while the collar is corduroy-lined, with hardware made from vintage nickel. There are two zippered side pockets and an embroidered logo on the sleeve. Looking at this jacket, the classic leather jacket look is clearly still there, with the offset zip being a clue to the classic design. The Ivy 2.0 is a little shorter than the version 1.0 to make it better suited for sportier motorcycles. 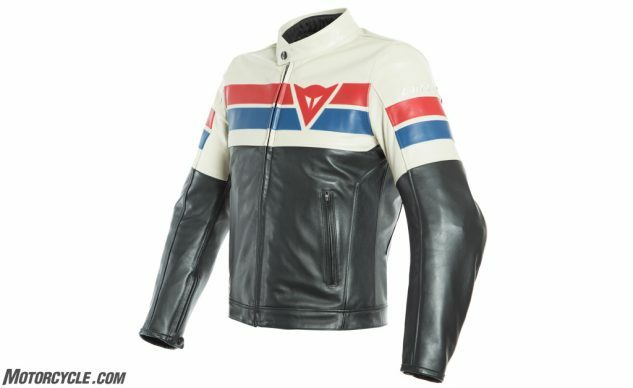 There are other ways Dainese could have invoked a vintage feel than naming its jacket the 8-Track, but it’s better than calling it the Betamax, we suppose. Regardless, despite the antiquated name, the 8-Track jacket is a clever mix of vintage styling and modern appeal. The full-grain cowhide is refined with Artemide for a sheen that’s not quite glossy, but definitely not matte. CE approved armor in the shoulder and elbows provides impact protection, and there’s a pocket for hard back armor, too. Featuring a thermal liner that can also be worn as a separate mid layer, the 8-Track is also versatile enough for chilly rides. Featuring suede inserts, connection loops for jeans, and separate neck and wrist adjustments, the 8-Track is a jacket that looks good on or off the motorcycle. It’s also available in a black/grey color option. Alpinestars isn’t the only one carrying the success of a past product into a new one. The Icon Motorhead 2 is the next step from the popular Motorhead jacket and is constructed from 1.1-1.3mm TrackSpec leather. It’s an understated jacket, but there’s no mistaking the huge ICON lettering across the chest. There are vents across the chest, as well as perforations in the leather to help with airflow. If things get a little chilly, a quilted liner is also part of the package (and is removable). Inside, impact protection is provided by D30 armor in the shoulders, elbow, and back. Pockets? Yep, the Motorhead has two on the outside as well as two more internally. There are even loops to route your headphone wires. Pagnol is all about premium quality and style. Sure, many companies say that, but the difference with Pagnol is its pricing. Pagnol sells direct to consumer, allowing it to keep costs lower than its competitors. With its first jacket offering, the M1, we see a silhouette inspired by more sporty jackets, but with the classic black leather jacket motif tweaked for the modern age. This means a slim fit like a sport cut, but without the flashy logos and in-your-face designs. The actual leather is 1.2mm tumble-aged cowhide, which will only look more rugged the more it’s used. There are armor pockets in the shoulders, elbows, and back occupied with ¼” padding as standard, but able to fit Sas-Tech armor for more robust protection. From a comfort perspective, strategically placed stretch material under the arms, and accordion panels on the elbows and back allow for better movement, while a mesh rayon liner is also included. There’s a total of four pockets (two inside, two outside), with ventilation zippers on the chest as well. Style points are capped off with embossed logos on the shoulders and brass hardware throughout. As a styling exercise, it’s difficult to successfully combine new and old as usually one aspect never fully gets realized. The Rev’It Akira Air Vintage jacket is a stunning example of when new meets old in just the right way. The distressed look of the perforated leather is a result of what Rev’It calls its Pull-Up tanning process, where the leather reacts to repeated creasing and use. Apart from the visual effect, it also makes the jacket feel broken-in the moment you get it, and it’ll only get more comfortable after that. There’s also a thermal liner to help keep you warmer on chilly mornings, but this is a jacket mostly meant for warmer rides. You’ll find CE-level 2 rated Seeflex protectors at the shoulders and elbows, and the pocket in the back allows you to upgrade to the CE-level 2 rated Seesoft back protector. In case you couldn’t tell from the picture, the Akira is cut slim for a race fit. This means the included exterior and interior pockets won’t hold much more than the essentials. Style and function come together perfectly in the Clash jacket by Roland Sands. Now you can ride your motorcycle to a concert and get on stage without ever looking out of place. The 1.1mm top grain cowhide is hand finished, washed and oiled/waxed to give it its distinct look, but other details like the offset zipper, quilted accents on the shoulder and lower back, and riveted reinforcements on the elbows add to the overall appearance rockstar motorcycle rider. Despite the classic look, the Clash is tailored with a performance riding fit, with rotated, pre-curved sleeves, drop back length, and relaxed collar opening. You’ll find pockets both inside and out, as well as a satin liner with embossed numbering. Speaking of pockets, the Clash features armor pockets in the shoulders, elbows, and back. Remember the jacket Marlon Brando wore in “The Wild One”? This is it. The Original. The Perfecto, by Schott. 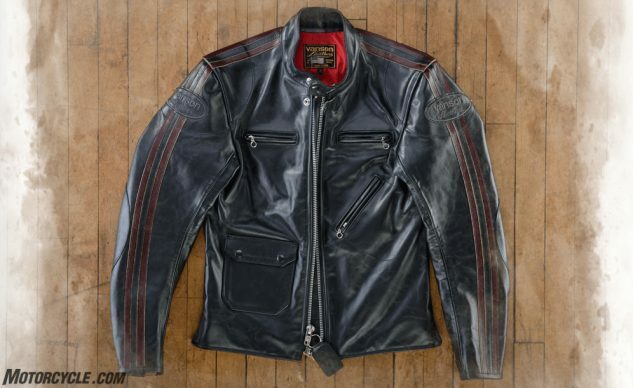 The grandaddy of them all, Schott and Brando defined the leather motorcycle genre with this jacket. Constructed from U. S. sourced, drum dyed, hand cut, heavyweight 3-3.5 oz. steerhide leather, the Perfecto is the standard to which others have followed. For example, take the offset zipper and slash cut front zip pocket. 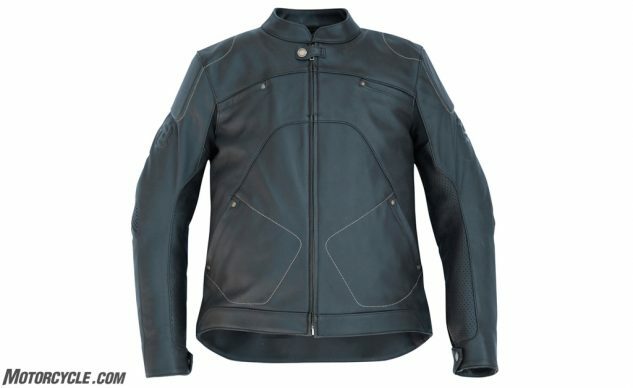 The Roland Sands jacket above has the same design, as do many other jackets from nearly every manufacturer. Another signature Schott design is the huge back panel design, but other signature touches include the snap-down lapels and attached belt with nickel plated buckle. There’s not actually any armor or padding inside, but for many people, we imagine this is a non-issue. 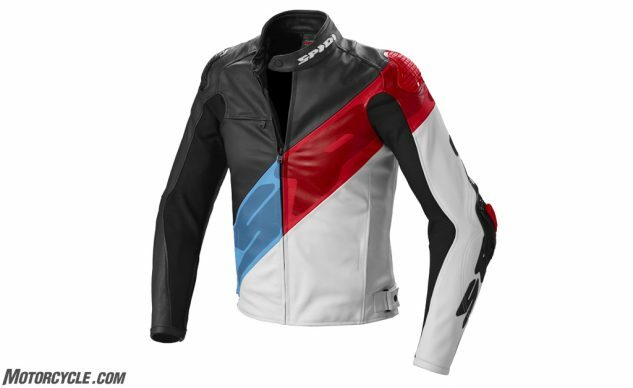 With the Spidi Super-R jacket we move away from the old school and into something thoroughly sporty and modern. Whereas the Clash jacket features an offset zipper, the Super-R has offset coloring. The chassis itself is made from full-grain 1.1-1.3mm bovine leather and there’s Spidi’s Warrior Tech external elbow sliders – ostensibly for promoting a slide during a crash, which is likely to happen if you try your best Marquez impression instead. ForceTech armor inserts are included at the elbows and shoulders and an optional Warrior protector can be worn in the back. Flex inserts on the arms give natural range of motion. The Super-R features a full zipper to be used with riding pants, and a snap system to use if you’re wearing riding jeans. An iconic American brand, Vanson is known for its leather jackets. Go on the company website and prepare to be bombarded with a variety of different options. 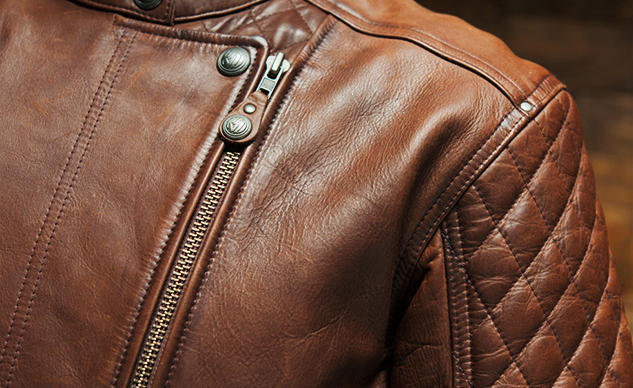 We picked this one simply because it’s called the Classic Leather Jacket – seemed like a no-brainer to us. Constructed from 1.2mm hide, Vanson uses a specially formulated hot wax recipe dating back before WW2 to give it its distinct sheen and look. To quote Vanson, “This is a living material that changes with use and time all the while gaining a fine patina from use.” Construction aside, the Classic also looks the part thanks to its four front zippers, including a slash-cut pocket. 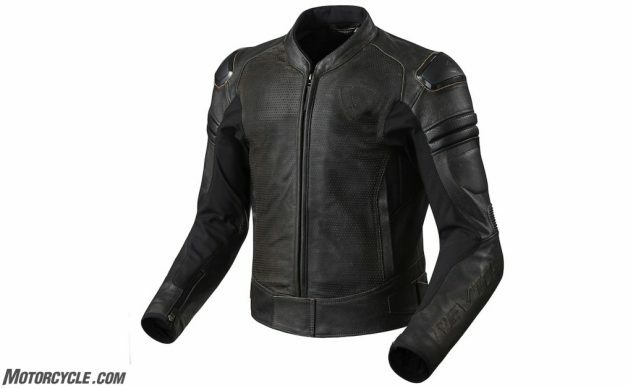 Double leather at the shoulders and elbows protect against road rash, while the main zipper is a two-way design. You’ll find redundant closures for the neck collar and wrist to help ensure everything stays put in a fall, racing stripes down the sleeves add to the look, and the classic is capped off with embroidered Vanson logos.